The leaf of perennial herbaceous plant Artemisia argyi levl. et Vant. of family Compositae. Collected in summer when not bloom. Gray and white color below leaves with lots of floss. Purified, dried in the sun or in the shadow; unprocessed or ground to velvet or stir-baked to charcoal. Pungent, bitter, warm, slightly toxic; liver, spleen and kidney meridians entered. Warm meridians and stop bleeding, dispel cold, prevent abortion. Being fragrant in smell, pungent in flavor and warm in nature it can dispel cold, and warm qi and blood to warm meridians as a main herb of stopping bleeding by warming meridian. It is indicated for bleeding due to deficiency cold, especially metrorrhagia and metrostaxis. 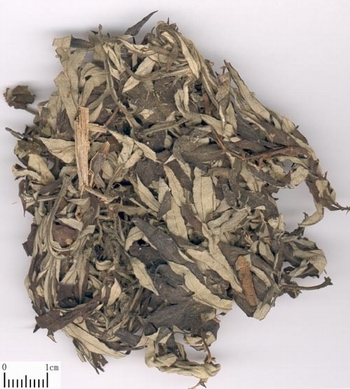 For metrorrhagia and metrostaxis due to deficiency cold of lower energizer and insecurity of thoroughfare and conception vessels, it is used singly in decoction or combined with meridian-warming, cold-dispelling herbs and blood-nourishing hemostatics. For instance, it is combined with E Jiao, Shao Yao, and Sheng Di Huang, etc. in Jiao Ai Tang from Jin Kui Yao Lue. This herb warms meridian and stops bleeding. For various bleeding such as haematemesis, epistaxis and hemoptysis due to recklessly blood flow due to blood heat, it is combined with heat-clearing and blood-cooling herbs, For instance it is combined with Sheng Di, Sheng He Ye, and Sheng Bai Ye (Ce Bai Ye), etc. in Si Sheng Wan from Fu Ren Da Quan Liang Fang. In this formula Ai Ye can not only enhance the action of stopping bleeding but prevent cold remaining stasis associated with many cold herbs. This herb can warm meridians and vessels, dispel cold and dampness, and alleviate pain and regulating menstruation. It is the main herb to treat lower energizer deficiency-cold or cold in uterus of gynecological diseases. It is commonly indicated for lower energizer deficiency cold, irregular menstruation, abdominal pain in menstrual periods, infertility due to cold uterus and clear leukorrhea and so on. It is usually combined with cold-dispelling herbs to alleviate pain and nourishing blood to regulate menstruation. For instance it is combined with Wu Zhu Yu, Rou Gui, Dang Gui and so on in Ai Fu Nuan Gong Wan from Zhi Zhi Fang (Effective Recipes from Renzhai House). 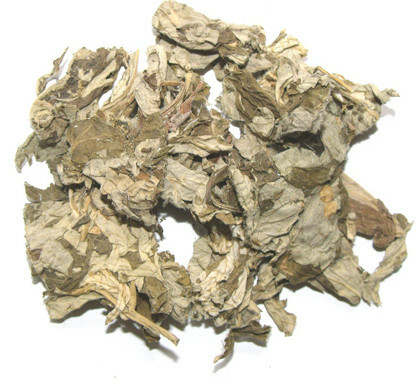 It is the main essential herb of warming uterus and preventing abortion in gynecology. In Zhou Hou Fang (A Hand Book of Prescriptions for Emergencies), it is decocted in wine and indicated for threatened abortion due to liver and kidney deficiency-cold during pregnancy. It is usually combined with blood-nourishing, kidney-tonifying and abortion-preventing herbs such as E Jiao and Sang Ji Sheng. In addition, it can be ground into velour and then made into moxa stick and moxa cone to fumigate body acupoints to warm qi and blood and penetrate meridians and collaterals indicated for various pain due to yang deficiency and exuberant cold or affection of external wind-cold-damp pathogen. Decoct 3~10g. Proper dose for external application. Stir-bake it to charcoal for stopping bleeding by warming meridians; the unprocessed for other actions.